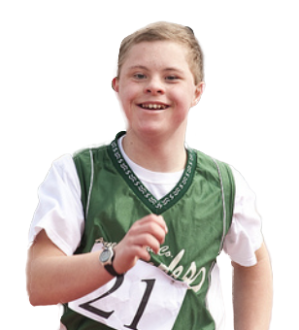 Our athletes with Fragile X Syndrome are used to overcoming challenges. They do so, every single day. Fragile X syndrome is a genetic disorder that affects a person’s development, especially that person’s behavior and ability to learn. In addition, Fragile X can affect communication skills, physical appearance, and sensitivity to noise, light, or similar information. Fragile X syndrome is the most common form of inherited intellectual and developmental disability. People with Fragile X syndrome may not have noticeable symptoms, or they can have serious symptoms that range from learning disabilities to cognitive and behavior problems. Fragile X results from a change or mutation in the Fragile X Mental Retardation 1 gene, which is found on the X chromosome. The gene normally makes a protein called Fragile X Mental Retardation Protein, or FMRP. This protein is important for creating and maintaining connections between cells in the brain and nervous system. The mutation causes the body to make only a little bit or none of the protein, which often causes the symptoms of Fragile X. Not everyone with the mutated FMR1 gene has symptoms of Fragile X syndrome, because the body may still be able to make FMRP. Severity of symptoms will depend on how much of the protein the body can make and the number of cells affected. Please note that females -- due to having two X chromosomes -- can usually make at least some FMRP. Therefore symptoms of Fragile X are often milder in females than in males. About 1 in 4,000 males and 1 in 8,000 females have Fragile X syndrome. What Are the Symptoms of Fragile X? Cognitive functioning. Many people with Fragile X have problems with intellectual functioning.These problems can range from the mild, such as learning disorders or problems with mathematics, to the severe, such as an intellectual or developmental disability.The syndrome may affect the ability to think, reason, and learn. NOTE: Because many people with Fragile X also have attention disorders, hyperactivity, anxiety, and language-processing problems, a person with Fragile X may have more capabilities than his or her IQ score suggests. Physical features. Most infants and young children with Fragile X don’t have specific features connected to the syndrome. But when they start to go through puberty, many will begin to develop physical features that are typical of those with Fragile X. These include: a narrow face, large head, large ears, flexible joints, flat feet, and a prominent forehead. Behavioral, social, and emotional. Most children with Fragile X have some behavioral challenges.They may be afraid or anxious in new situations. They may have trouble making eye contact with other people. Boys, especially, may have trouble paying attention or be aggressive. Girls may be shy around new people. They may also have attention disorders and problems with hyperactivity. Speech and language. Most boys with Fragile X have some problems with speech and language. They may have trouble speaking clearly, may stutter, or may leave out parts of words. They may also have problems understanding other people’s social cues, such as tone of voice or specific types of body language. Girls usually do not have severe problems with speech or language. Sensory. Many children with Fragile X are bothered by certain sensations, such as bright light, loud noises, or the way certain clothing feels on their bodies.These sensory issues might cause them to act out or display behavior problems. NOTE: Between 6 percent and 20 percent of children with Fragile X syndrome have seizures. Seizures associated with the syndrome are more common in boys than in girls. When Jonathan was a little boy, he'd stay alone in his room, never wanting to talk or interact with family members or anyone else. He spent most of his time lining up his toys in straight lines. Like other children with Fragile X, he avoided eye contact and shunned any physical contact, even with loved ones. When Jonathan's parents got him started in Special Olympics, this gave him a unique outlet. The coaches understood his disability and helped him find a comfort zone -- and soon he was playing whatever sport was in season -- softball, speedskating, golf, swimming and tennis. He began making direct eye contact and even shaking people's hands, despite his tactile sensitivity issues. The lessons he has learned through his sports training and practice have had impact on other aspects of Jonathan’s life. He began to be more interested in school and he learned how to persevere – and not give up on something if it seems difficult. He also began setting realistic goals for himself, and learned that if he works hard and is determined enough, he will eventually succeed – just as he did in sports. Jonathan has graduated from high school with an academic diploma and completed an associate’s degree in computer science, persevering through eight years to earn that degree. He has also been a longtime employee of Publix Supermarkets. These are accomplishments that his parents were told he could never hope to achieve. Says mom, Kathy: "We truly believe that his personal success, his transformation, is due primarily to his participation in Special Olympics." Jen had always wanted to take part in sports like her older brothers and other kids her age, but she had trouble keeping up. Due to Fragile X , she has slower processing times and trouble maintaining eye contact with coaches and other players. She also had motor skills issues. She tried tennis at a local club, but it was at times frustrating. Then her family found a Special Olympics program that made a huge difference. Her mom says the Special Olympics coaches were able to break down the lessons, skills and drills she needed for tennis so that Jen could really understand the game. Jen isn’t the only athlete in her family. Her younger sister, Maria, 12, participates in Special Olympics bowling. Maria also has Fragile X, along with Down syndrome. The Special Olympics bowling program was a great fit for her. Their mom says she’s seen so many positive changes in her daughters through Special Olympics. Jen has also found a best friend through Special Olympics -- her short-court doubles partner, Gina. “They have an amazing friendship,” says mom, a friendship that continues outside of Special Olympics. Sources include the Eunice Kennedy Shriver National Institute of Child Health and Human Development/National Institutes of Health, the American Association of Intellectual and Developmental Disabilities, and the Centers for Disease Control and Prevention, and Special Olympics.